On December 22, 1862, John Adams Brackenridge died and was buried in this cemetery. cemetery to be buried with her husband. 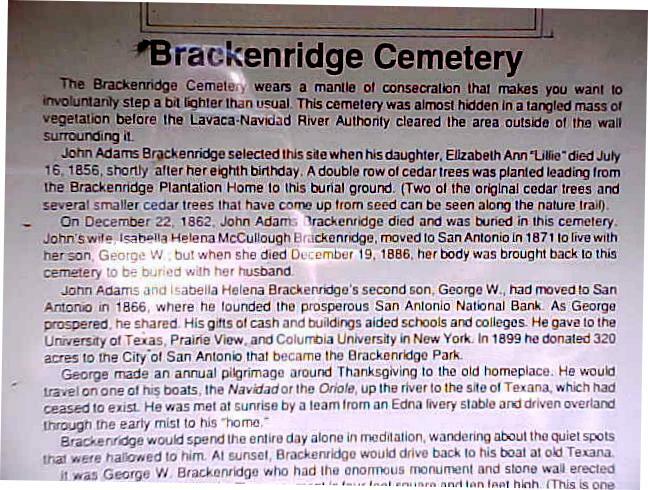 acres to the City of San Antonio that became the Brackenridge Park. through the early mist to his "home." that were hallowed to him. At sunset, Brackenridge would drive back to his boat at old Texana. It was George W. Brackenridge who had the enormous monument and stone wall erected.